Recently we share All Idea USSD Codes list to check every thing of Idea mobile number. We share post recent how to check own mobile number of Idea. 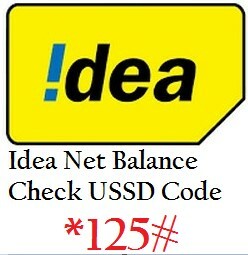 If you want to know that how to check Idea net balance 2G/3G/4G. Then Idea net balance check USSD code / number will help you. Using the some special Idea USSD codes you can check your Idea Net balance. Many times what happen suddenly Idea Net balance over and they charge from our Main balance. But now every use unlimited data + calling pack of Idea. So this problem is no longer available. but if we want to check our daily data limit spending amount the use Idea ussd codes. 4. Get Internet data + Main balance notification every time on your phone notification section. Must see Idea USSD Codes LIst to check all other things at Idea. Like Active / Deactivate services, SMS pack, Prepaid Balance check and more.